They trudged, climbed over the rugged, mighty Himalayas, scrambling over rocks, through snow and ice, at night. A group of 28, including 10 children, they set out from their homeland, Tibet, to escape the severe Chinese regime which has occupied their country since 1950. Over a million Tibetans perished in the mass genocide which followed the occupation. In 1959, the 14th Dali Lama, Tenzin Gyatso, led his people into exile. Since then some 100,000 Tibetans, like the group mentioned above, have made this arduous journey to escape Chinese persecution. Kalsang escaped from Tibet over the Himalayas in 2006. 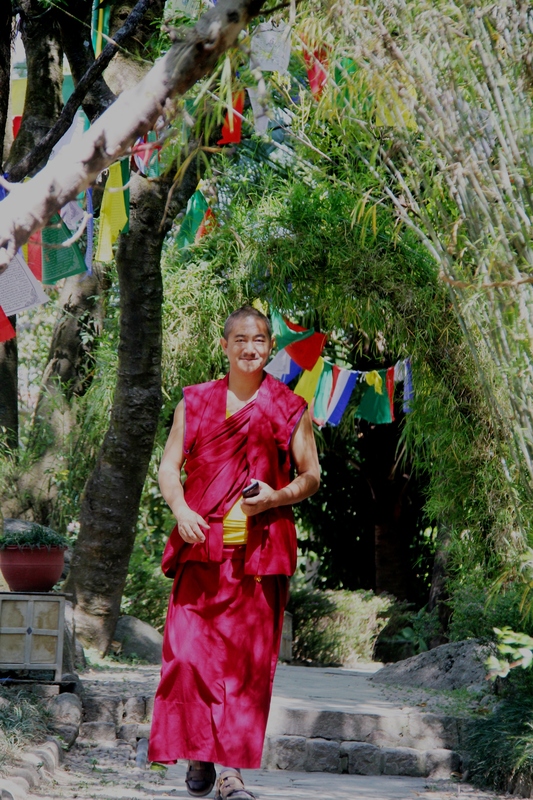 Kalsang now works as a guide at the Norbulingka Institute, a trust under the chairmanship of the Dalai Lama, the spiritual and temporal leader of the Tibetan people. The Institute, which is dedicated to the preservation of Tibetan culture, is headquartered in Dharamsala in northern India, the center of the Tibetan government in exile. A visit to the town, a former British hill station perched high on a steep slope under the shadow of the snow-capped Dhauladhar mountain range, is fascinating, if not heart breaking. Several thousand Tibetan exiles, including the Dali Lama, live in the town, most in McLeodGanj, the upper part of the town where the institute and the Dali Lama’s home are located. The stories of escape and hope are astonishing, tragic. “We have hope. One day we will go back,” a young woman said. blossoms. Strings of small, colorful prayer flags add a festive note. Well-fed, friendly dogs wander about. In contrast to the dusty, dirty, noisy, rundown surroundings, it seems like a tiny paradise. At the Norbulingka Institute, Tibetan refugees learn traditional crafts. Our tour group visited the Dali Lama’s Buddhist temple. Although at the time His Holiness was in residence, he was not seeing visitors, we were told. We visited workshops where young Tibetans in exile were learning and practicing traditional Tibetan crafts, (scroll painting, embroidery, metalwork, wood carving etc.) Many of their works are for sale at the institute gift shop. We met many younger Tibetans at the Tibetan Children’s Village (TCV). The Dali Lama directed that a center be established for the thousands of orphans and destitute children ravaged by war. Today 1,700 Tibetan children live and study at this village. Most have been smuggled over the mountains from Tibet where the Tibetan culture and language are suppressed, where parents see no hope, no future for their children. They pay for their children’s escape to freedom, knowing they may never see them again. The children in the village live in small, family groups with foster parents. 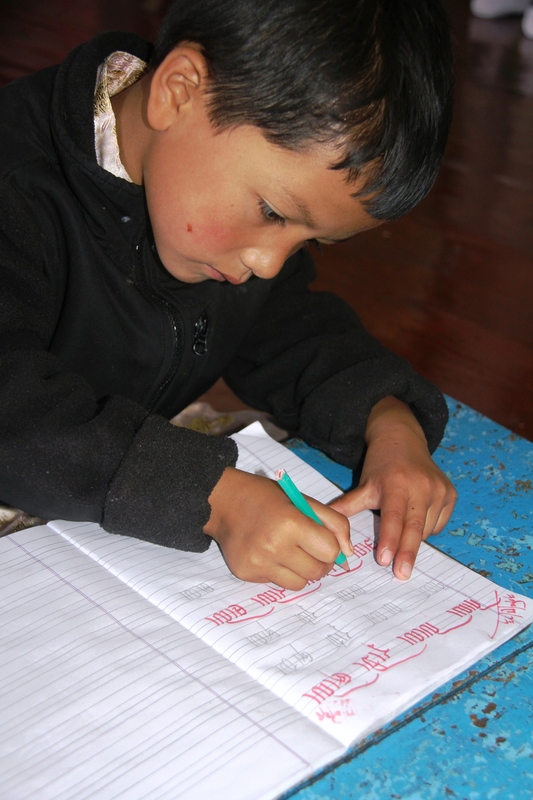 They are taught both the Tibetan language and English. There are four other villages for Tibetan children, as well as schools and vocational centers in India, under the umbrella of TCV. 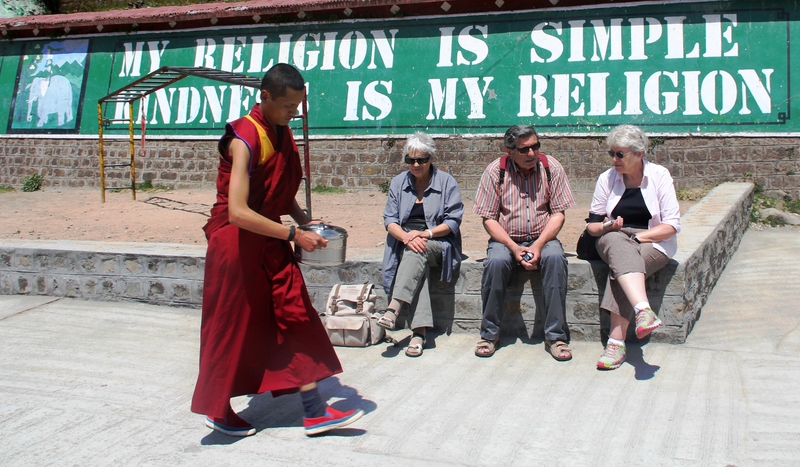 A visit to remote Dharamsala is an undertaking. Our group of 12 had to abandon our small bus and ride in three four-wheel drive vehicles for the climb over skinny, scary roads to the shabby town of ugly structures and tacky souvenir shops – but with a breathtaking backdrop, when visible. Having been intrigued about the fabulous Himalayas for years, I was eager for some to-die-for views and photo opps. Not to be. If and when the clouds vanished, it was only for seconds. These mountains have mastered hide and seek, excelling at hiding. Views of the Himalayas like this were rare and lasted only seconds. The Tibet Museum in the town is the place to learn more about Tibet, the Chinese occupation and the present situation. Documentation and photographs detail the invasion, treacherous escapes, human rights abuses and present-day realities. The town’s bazaar, a collection of shops and stalls along the steep main street, is the place to bargain for souvenirs: jewelry, trinkets, scarves and more. Dharamsala is popular as a center for meditation, yoga and other esoteric retreats. It also attracts those interested in serious mountain trekking and rock climbing. A writer in the Guardian called the town, known as “Little Tibet,” a “unique place with its mix of Indian hill people, Tibetan exiles and ‘spiritual’ tourists.” It is well worth the effort to visit this unique and alluring place, to experience first-hand the plight and tragedy of Tibet. More on India coming soon: Captivating Kashmir. If not already a Tales and Travel follower, sign up (upper right) so you will not miss this and future posts. Your address is kept private and never shared. Cows are at home on Dharamsala’s main street. And thank you, Bernard. I knew so little about Tibet and its exiles. Yes, the visit was both fascinating and very sad. Certainly a fascinating account albeit sad in so many ways. Still there is some hope for the children who have escaped and I, too, loved the photograph of the small schoolchild with fingers over nose. I shall never go, Leah, so thank you for this insight. From what you described in your blog post on Tibet, it seemed more than grim, very sad and tragic. Those who have escaped are so fortunate. At least they have a better life, but still grieve for their lost country. That was beautifully written, Leah. The people that I saw while in Tibet seemed focused on the next life,maybe because their current life is so grim. It was not a happy place. Glad you liked it Jane. I like sharing my experiences on my blog. Yes, there was a mystical, calming ambiance at the Tibet in exile center we visited in N. India. Someday I will get there. Yes you will…It is worth a visit. Enlightening story…exceptional photos. Thank you, Leah, for broadening my horizons once again! Thanks, Gayle. See my above response to Lynne. 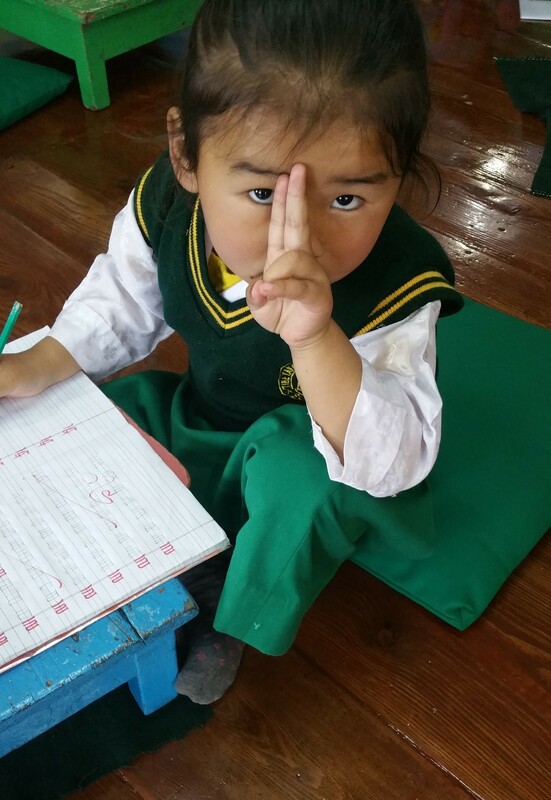 It is gratifying to know that this post may help readers gain a clearer picture of the plight of Tibet.
. Love the image of the school child, two fingers over the nose: Oh, those eyes say so much! Thanks for this beautiful article and pics. I’ve always been interested in Tibet’s future after its invasion by Chinese troops and Chinese people. Tibetan culture, religion, language… are really at risk. How sad to be in exile! and for kids to be separated from their parents. Yes, Christine, the saga of Tibet is very sad. It is hard to imagine sending your children away with no certainty that you will ever see them again. The Tibetans in exile are dedicated and determined to preserve their language and culture. One cannot help but be impressed by their perseverance amidst countless obstacles. I had not realized the extent of the Tibet crisis. The visit was an enlightening experience. Thanks for your comment. Hope all well in bella italia. fascinating…now I have another destination to add to my list…thank you, Leah! Thanks. You do bring your trips to life. Sunday we eat the sacred cow,good steak in view………..